First things first: the new AHIQ challenge can now be found here and Ann's come up with something really interesting. I would normally put up a post on the AHIQ blog too (this being the 4th Tuesday) but it seems more appropriate this time to let the challenge post to be the focus, so I will content myself with urging you to go and check it out. While Ann has been dreaming up new vistas for to explore, I have been pootling along making my little lighthouses (and arguing, endlessly, with BT - for those of you in the UK). It has occurred to me that if I sort out some wadding and backing these would be the perfect thing to roll up and stick in my holiday suitcase, since Mr SewSlowly tells me very firmly that I can't take a whole quilt with me (and we are flying, so I guess that's fair enough). and made a start on a third. In case you are wondering the strange state of my cutting mat is due to having stencilled on top of it without remembering to put down newspaper. This will be the last one for a while, as I want to take a run at the new challenge. I am still quilting too, every day, with dogged determination. 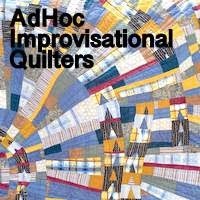 Why is it that some quilts seem to be done surprisingly fast while others take forever. I swear that after a week of quilting I have barely dented the amount still to be done. Ho hum. Nothing for it but to keep going. Are you still using real light houses as the inspiration for your piecing work or are these latest all created improvisationally? Nice small project for the road. Me, I'm into random hexie peices that will go into some sort of colorful improve that is floating around in my head. Great work, Kaja. Have a good trip. I'm on my way over to Ann's to see what she's cooked up. This one really makes me think of seaside! Have a wonderful trip! Making lighthouse pillows is such a good idea. I like how these are coming along and think they will be perfect bits to work on while on vacation. That bird fabric really plays well with the whole idea of this block. Very cool.